Samsung set to showcase Galaxy Note 8 in New York in Aug.
Samsung Electronics Co. is expected to showcase its Galaxy Note 8 phablet in New York in August, industry sources said Tuesday, which is set to compete with the next flagship by Apple Inc. 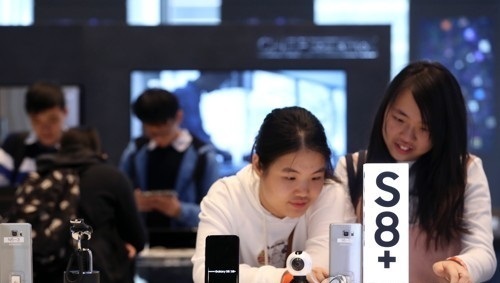 According to the sources, the South Korean tech giant is currently considering unveiling its large mobile device in the third or fourth week of August. While the company earlier planned to introduce the new phablet at the Internationale Funkausstellung Berlin held in September, industry watchers said the revised schedule apparently came as its US archrival is also widely expected to release its new iPhone in early fall. Observers said the next iPhone is likely to be shown off in September. The Galaxy Note 8 is expected to come with a 6.3-inch display, along with top-notch features such as the voice assistant Bixby that was first showcased on the Galaxy S8 smartphones. Industry watchers said the Galaxy Note 8 is also anticipated to become Samsung's first flagship device to come with a dual camera that can allow people to take both wide and regular angle shots.